Continuous mingling of matter and light. Constellations, brilliant and bright. Faster than sound, always out of sight. Where unknown roads in outer space await us. To celestial bright techno empires … the K continues its voyage to spaces where you can hear the light! And this time, they will do it in a way they have never done before with some full on live techno action, created in the moment, erupted from the vibe. Surgeon has been at the forefront of UK techno since 1994. His debut EP is regarded by many as seminal, launching his career along with several early Downwards releases, causing a ripple of excitement through the techno cognoscenti of the time. Surgeon has been prolific since, with three albums on Tresor and numerous Counterbalance and Dynamic Tension EPs as well as his 'Breaking the Frame' LP in 2011 “Over the course of his career, the Birmingham resident has perfected a unique and uncommonly effective production style. His is a tough techno sound with an industrial murk about it but also plenty of funk, swing and a sophisticated sense of dub-space learned in part from his Chain Reaction contemporaries in Berlin. Proving that hard can also be smart, sensuous and danceable, the influence of Surgeon on the ruling Ostgut/ Berghain sound with DJs/producers like Marcel Dettmann, Shed, … – is substantial”. (Fact Magazine). Further evidence of these multi-functional production skills can be seen on Surgeon's impressive remix CV, working with the biggest names in techno (Dave Clarke, Luke Slater/PAS, Green Velvet, Hardfloor, the Black Dog etc), Thom Yorke (Radiohead), Glasgow post-rock outfit Mogwai, old masters Faust and Coil, and most recently, artists such Moderat, Shed, Traversable Wormhole and Scuba as well as his DJ mixes for Warp and Fabric amongst others. Live improvisation has become a more important part of all of his performances but this one will be fully live. Brace yourselves! Jeroen Search simultaneously is one of techno’s most influential producers and well-kept public secrets. Consistently putting out quality music since the mid nineties on among many others his own genre-shaping Search imprint, he still resides where he has been for many years now: the absolute cutting edge. Named by many as a source of inspiration, Jeroen Search embodies a clear and honest interpretation of techno. His tracks, while audibly open to new and exciting musical influences, always remain true to that typical, inimitable Search-sound. He has seen little to no need to completely reinvent himself at any stage as most, if not all, of his work communicates itself with great ease due to its truly timeless nature. Jeroen’s approach to music production is an unorthodox one; he records all his tracks in a single take and does all his editing live. Constantly pushing his creativity by trying to get the most out of a minimal setup Jeroen remains active in the studio. Jeroen Search Live, is more than just an excellent showcase of his work. It’s a journey through the vast landscape of techno with an expert storyteller at the helm. An anonymous producer with a gritty, heads-down style of techno and a focus on vinyl, SNTS first surfaced in late 2012. He's been behind two record trilogies, Chapters and Scenes, issued through his self-titled label, and also earned appearances on Horizontal Ground and Edit Select Records. An artist with lots of mystery that’s what we love at Kozzmozz, especially when the music speaks for itself. And also he will be bringing all of his own productions Live! Parheim started playing under the alias Fubar, mostly playing the harder styles. A few years ago he decided to take on a new approach that better reflected his broad interest in art and electronic music. Parheim was born, focusing on melodic and atmospheric soundscapes. He creates his sounds using hardware synthesizers which he now also performs live. Considering techno music as spiritual currency, he aims to bring an elevating experience. Parheim, a modern mystic with a mission, has had releases on Assassin Soldier and Refuge Digital and now hosts the Plasma parties in Decadance. After 4 months of working in the studio, building a complete new hardware only Live set from scratch, he’s coming out of his cave and will take us on a flight! And off course there’s also Kr!z. He has been a Kozzmozz resident for more than a decade now but he’s much more than that and can easily take his place between the international guests. Kr!z always had a strong sympathy for the more gloomy, dark, rawer sound of techno. In 2007 he started his own label 'Token' and rapidly established the label as a fixed value in the techno scene of today by bringing timeless & powerful techno. His Token label nights are also a great success with memorable nights in Berlin (Berghain & Tresor), Brussels (Fuse), Shanghai, London, Rotterdam to South America. Our other resident, Spacid has a colourful 26 years of dj-experience. And it shows. At Kozzmozz he often plays the warm-up set and knows how to slowly take the party to the next level. He understands how to adapt to various atmospheres depending on the venue, people and mood, without ever renouncing his roots or musical beliefs. It’s safe to say that Spacid is an established value in the Belgian underground scene and we haven’t heard the last of him yet. As he would say: “Love the past, play the future”. 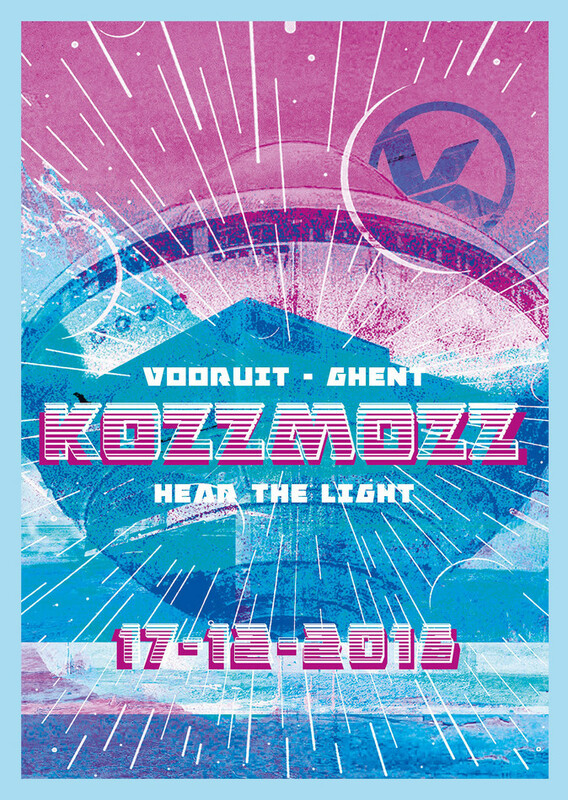 Join us on our next Kozzmozz voyage and Rave, Rave against the dying of the light!